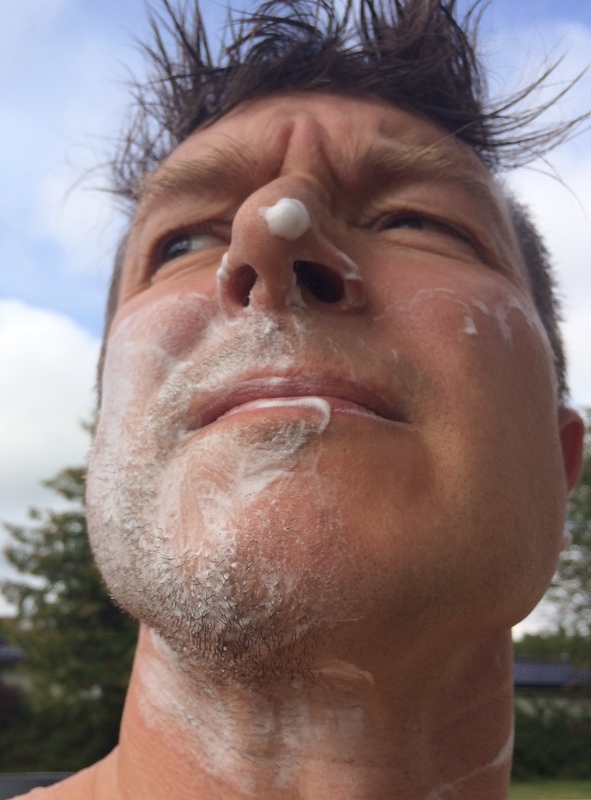 The Great Shaving Cream Investigation - Round 3 - Well Dressed Dad - It is a proper menswear blog. Like, with original words and opinions and suchlike. Round 1 of the Great Shaving Cream Investigation saw Billy Jealousy soundly trounce Gentleman’s Tonic, with both seeing points lost for unsound ingredients. Round 2 saw Kiehl’s lose soundly to Body Shop, with Body shop going into the lead with no deductions and Kiehl’s getting maximum deductions for unsound ingredients. Which was ironic given how they profile themselves on using only good ingredients! A week later and it’s time for round three. A weeks worth of new stubble awaits and a pair of new products are ready to be tested. The first one this time is the odd-sounding British Mitchell’s Wool Fat Soap, a traditional shaving soap in a wood box requiring that I unwrap my new badger-hair brush. 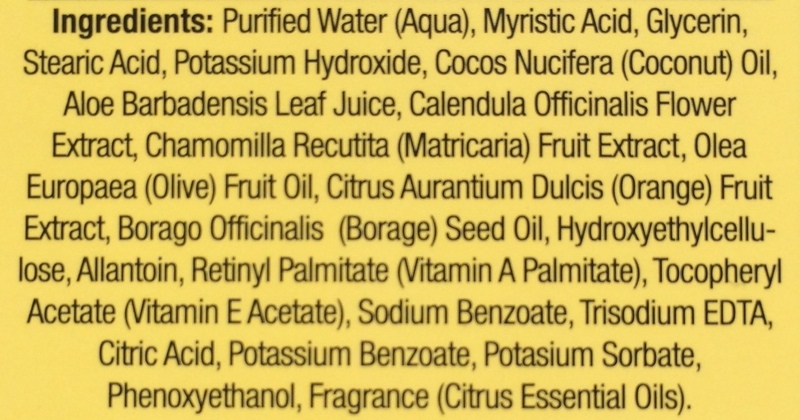 The second is the American Lucky Tiger, which proudly proclaims in big letters on the outside of the box that it is Paraben Free. This should put them off to a good start then! The Mitchell’s came recommended by a chap on Instagram. I just really liked the look of the Lucky Tiger packaging. 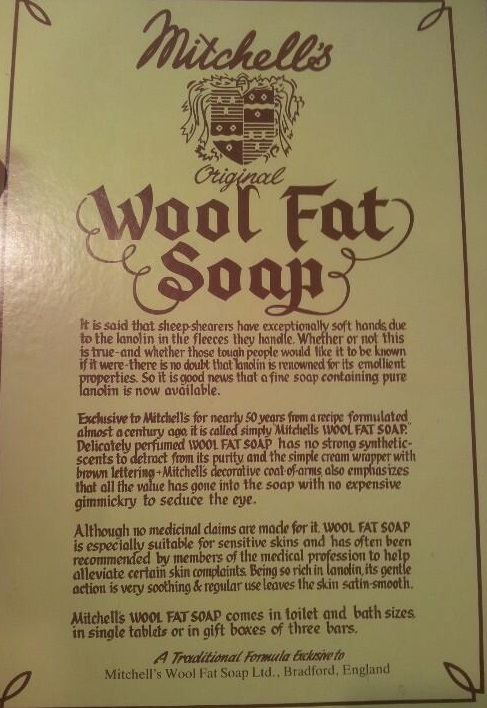 I’ll start the intro to the Mitchell’s Wool Fat Shaving Soap by admitting that I really have no firm proof that this is in fact Mitchell’s Wool Fat Shaving Soap. 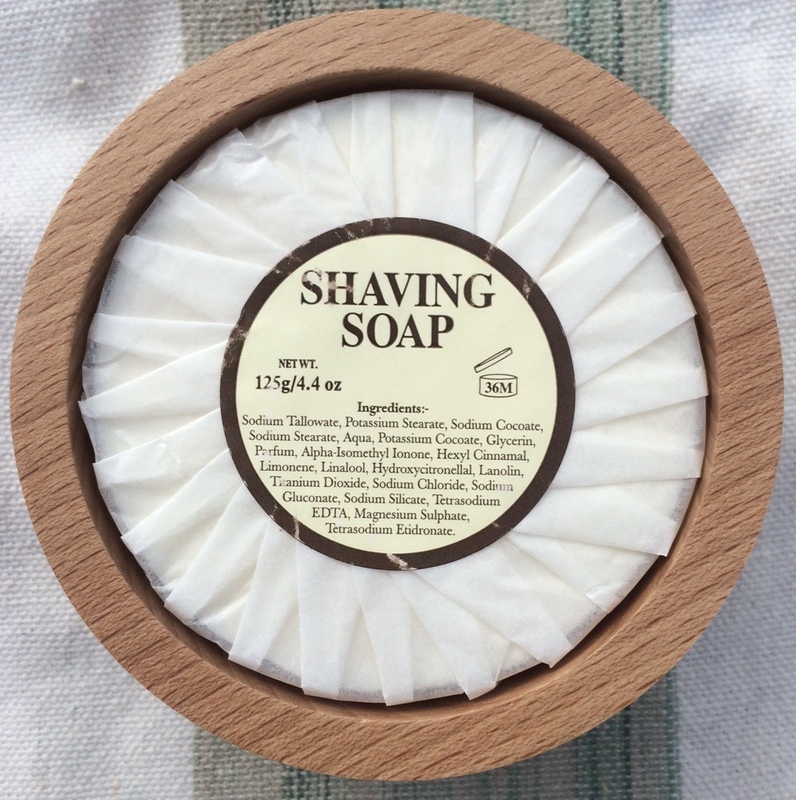 I know what I ordered, but given that there is nowhere on the received product that mentions “Mitchell” or indeed any other maker, or any product name other than “Shaving Soap”, I’m not totally certain what I have tested. 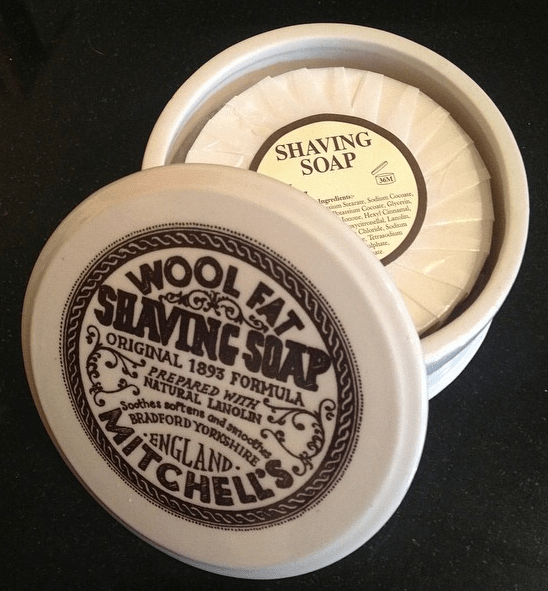 I’ve chosen to trust the supplier though, so we’ll consider it a legit example of Mitchell’s Wool Fat Shaving Soap (which is an incredibly long-winded product name to keep typing!). As shown, this was supplied in a nice wood bowl, with lid. In fact, available from this supplier in three different types of wood, so as to cater for the true connoisseur. This was the first time I’ve used a shaving lube in anything but cream or aerosol form, so this was quite exciting. The shaving soap itself it utterly soap-like, in both consistency and smell, which does make me wonder a little about what might be the difference between a hand soap and a shaving soap. I’ll freely admit that no one recommended this one, and I had no idea what to expect. The packaging indicates it is full of Asian delights and I’m a confirmed fan of Tiger Balm for a sore back. Oddly though, it is produced in the US, and appears to have no links to Asia at all, apart from the artwork of the packaging. The packaging gives it extra points in my book though. In a time when men’s grooming is a huge thing and metrosexual an actual word, “Lucky Tiger” harks back to the days when men were guys and a can of shaving cream and a bar of soap was all the grooming products a chap needed, or indeed wanted. Authentically manly gear. And in production since 1935. So, another good warm shower to moisten my face up and prepare for another shaving showdown. Products placed at the ready, a fresh blade in the razor. 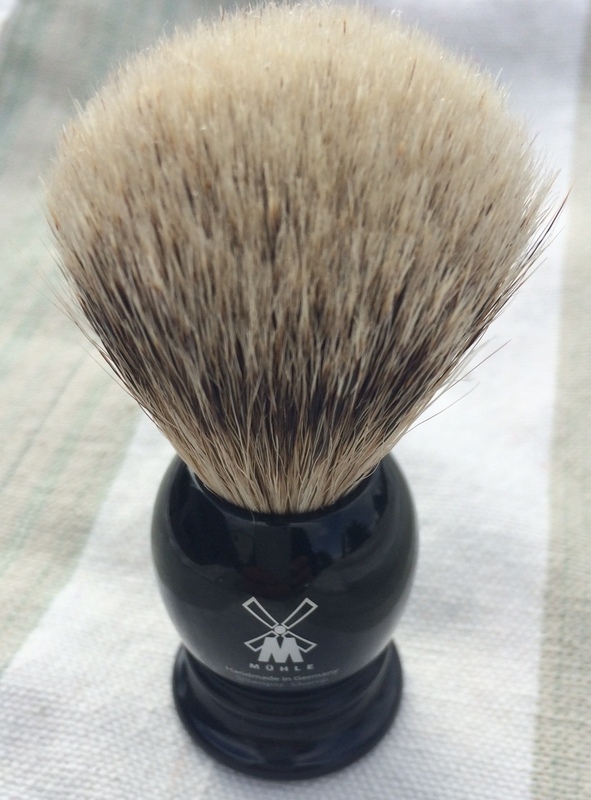 I did make sure I knew how the process of using a brush and a shaving soap worked beforehand, so I wetted my new badger hair brush and set to work whipping up a lather. And it was a lot less fussy than I had imagined! Transferring this from soap to face wasn’t all that difficult either. Just brush on, brush it around, fetch more, repeat. Not unlike using a shaving cream really. 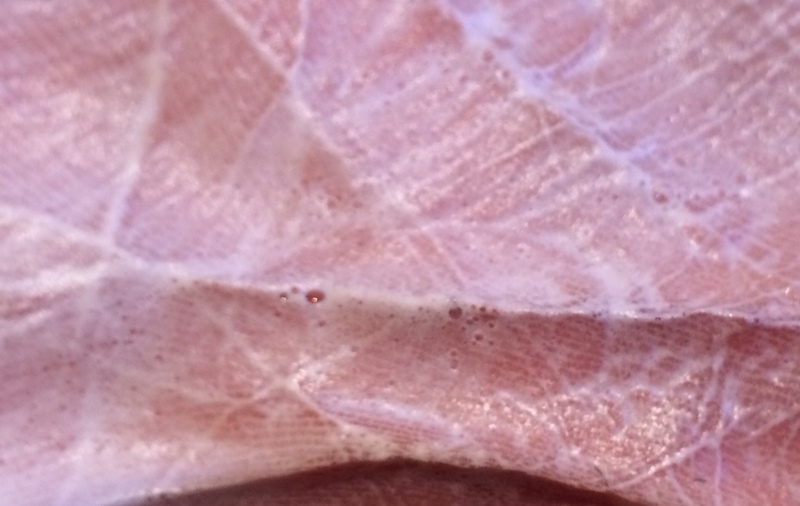 While it’s not truly thick, it stays in place and proved to be a decent lubricant. First I shaved down, a fresh brushing of soap, then shaved across, another application of soap, then up. The brush actually made the process of reapplying a bit less messy than having both hands full of cream. 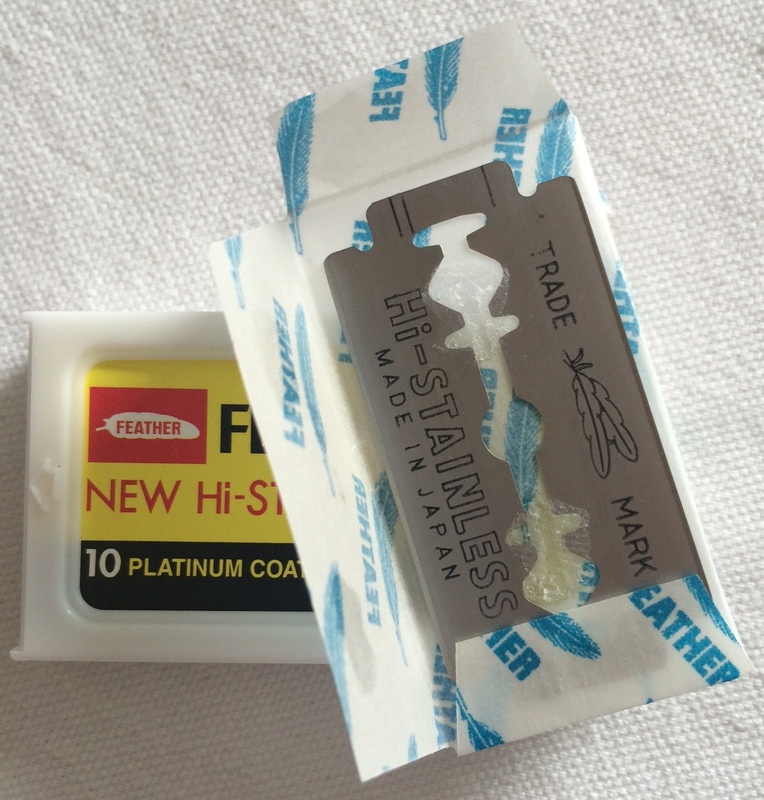 The shaving, with a fresh blade naturally, went smoothly and without issues. The supplier of this soap says it is rich in lanolin and good for sensitive skin, I have no quibbles with the claims. So, half my face razored free of stubble and time for today’s second product. The Lucky Tiger cream is a little more fluid than others, but applies well, and indeed does smell nice. It includes chamomile, olive fruit oil, calendula and borage oil, which are ingredients to calm and soothe the skin, to lubricate, protect, rejuvenate, soften and brighten the skin. It’s almost sounds a bit much. It does a nice job of rubbing in, and stays in place as it should. 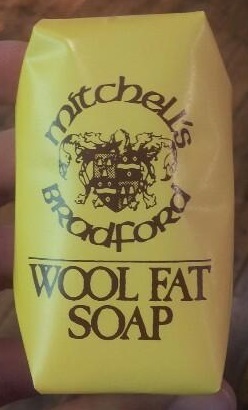 While it does a good job of lubricating, I have a nagging feeling it’s not quite as smooth as the wool fat soap. This may be reason for a retest on this one. The manly feeling goes a long way though, next time I’ll wear a wife-beater while shaving, whilst listening to some 50’s rock’n roll. Both soaps rinse off without issues, though the soap side does feel decidedly soapy. No real issues in this respect though. Over the next few hours I feel very little razor burn, which to me is the true test of how well the shaving cream has worked. This indicates that both of today’s products have performed well. No real surprise in the scores for lubrication, it did it’s job well, though not quite as well as the previous top scorers where the blade felt almost no friction at all. Above average grade for consistency, as well, though not top. The smell is a little above average, though not top marks. 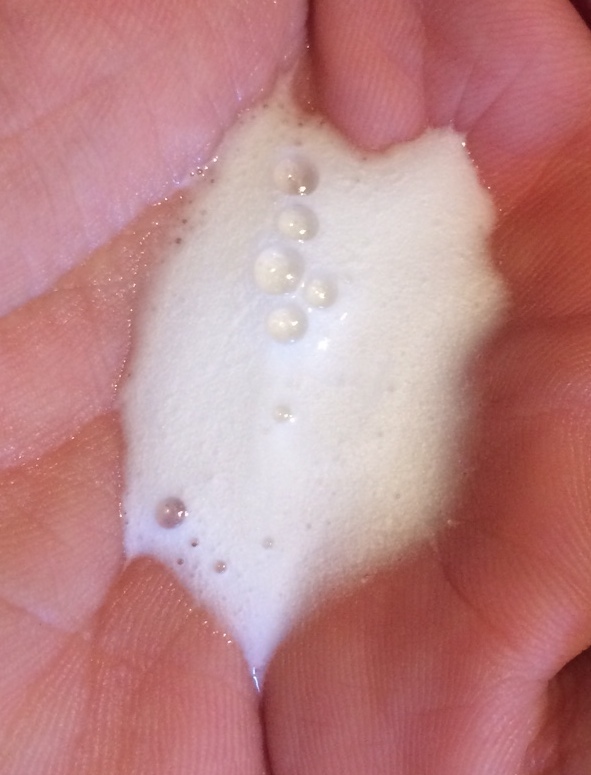 It smells pleasantly of soap, but soap is soap. Smells can be better, and can be much worse. The packaging was a disappointment, though that may only partly be Mitchell’s fault. I think I may have ordered mine in a custom wood bowl, but if I’d ordered the refill I would have got it in a Mitchell’s branded box. Still, you’d think they would put the name of the product and who made it on the wrapping as well, right? And then we have the ingredients. I’m pleased to say that I find nothing objectionable here. So no deductions for Mitchell’s! This works out to a total of 26 of 40 points. As mentioned, the lubrication and consistency are good. Among the top of the range of products tested so far. It smells nice and fresh as well. The packaging I consider to be the most pleasing so far. Distinctive, well executed and nicely evocative of more manly times. The metal-capped bottle is also a nice touch in a world were plastic tubes are the norm. It just seems a more adult way of packaging. Plus a bottle stands up nicely in your shaving cupboard. And Lucky Tiger has none of the bad stuff I’ve flagged on a few other products, so no deductions here. This is encouraging as it brings the total of paraben-free products up to half of the products tested so far. This gives Lucky Tiger a total of 31 of 40 points, which actually puts it in the lead so far! With regards to shaving experience these two products were almost equal and in reality there is very little to chose between them. 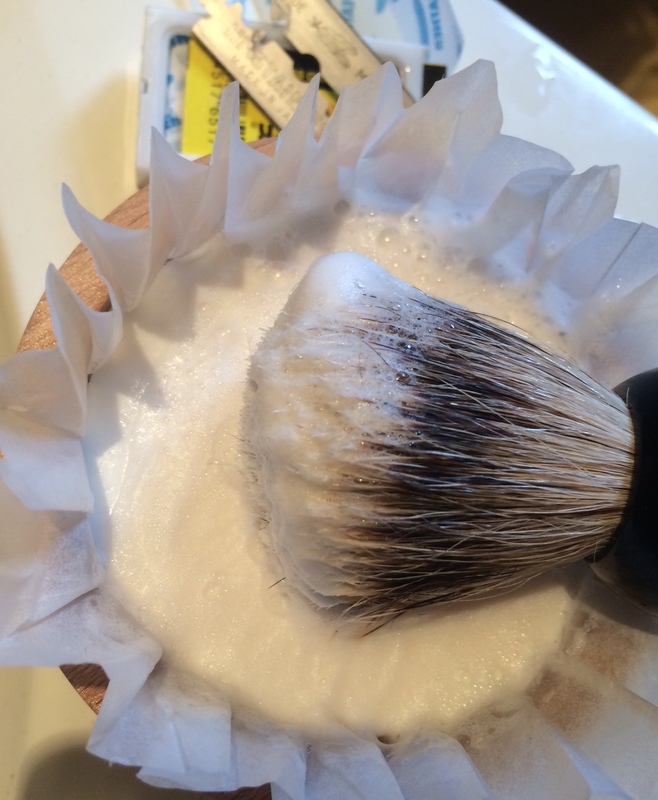 If you like the idea of using a brush to apply, then go for the soap. If you like the lovely packaging of the Lucky Tiger, go for that one. Both are great products and will not disappoint. The participants for the next round are not yet determined. I’m still waiting for 3 products to arrive, and may buy another in London this week. Given that there are about 1700 different products available to aid the gentleman shaver though, I’ll terminate testing at some point soon so as not to bankrupt myself buying various creams! So, what is your firm favourite? I’ve given the Body Shop product a try but still prefer shaving oil, I will try the Lucky Tiger when I eventually use up the BS cream. 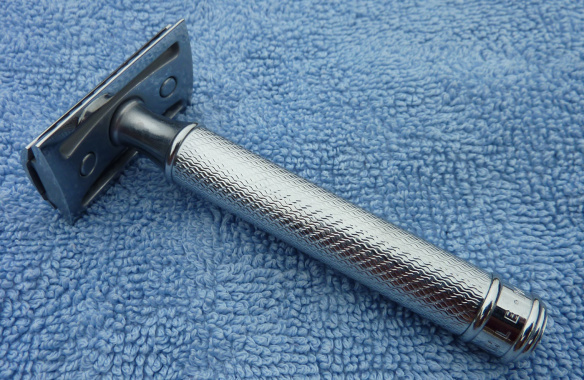 I have however been inspired to buy a “proper” razor so it’s back to the 70’s for my chin and cheeks! For the record I don’t have a goatee but was intrigued by the device and then found the review – honest!